The heat wave continued through my final day of riding, and so I was on the bike again shortly after 5am. The fog in the lowlands, as the sun rises over the mountains. Today's ride was bittersweet. I reflected on all the positives - the miles I've covered, the people I've met, the experiences I've had. And I reflected on the sorrow of an amazing trip coming to an end. My ride was mostly on back roads today. I'm glad my final ride was through Vermont, the winner of the Northeastern Beauty Contest. I could not think of a more gorgeous ride to reflect on the bittersweetness of this final day. I rode through three covered bridges today. 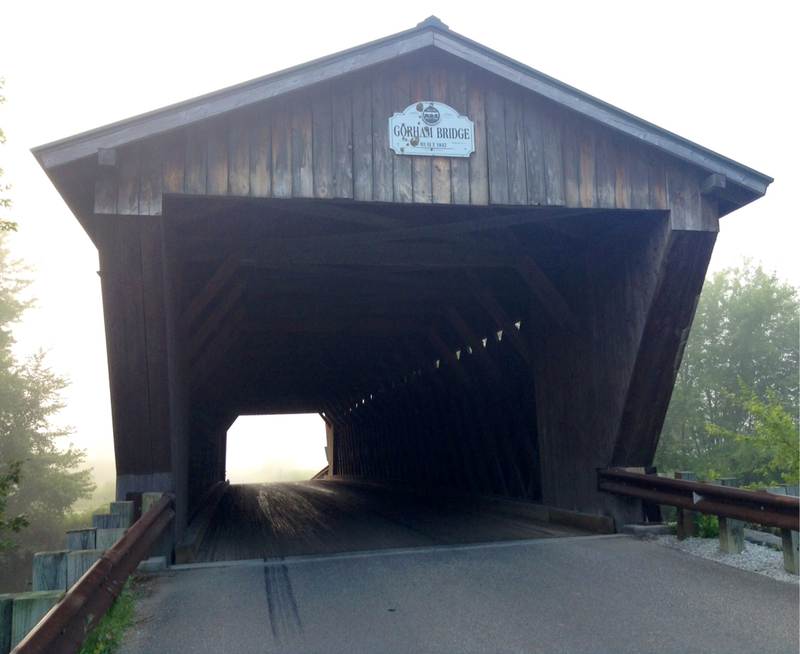 The Gorham Bridge was a portal into a foggy dimension. It was a hilly ride. At some point early in today's ride, I'm convinced that I developed an allergy to hills. Perhaps it was merely the high heat and humidity that made me curse every hill I saw. Ah, but when I reached the top, the descents were pure deliciousness. I briefly closed my eyes and savored the feeling of the wind against my face. In a conversation with yesterday's Warm Showers host, Liz, we talked about what exactly it is that makes Vermont so wonderful. 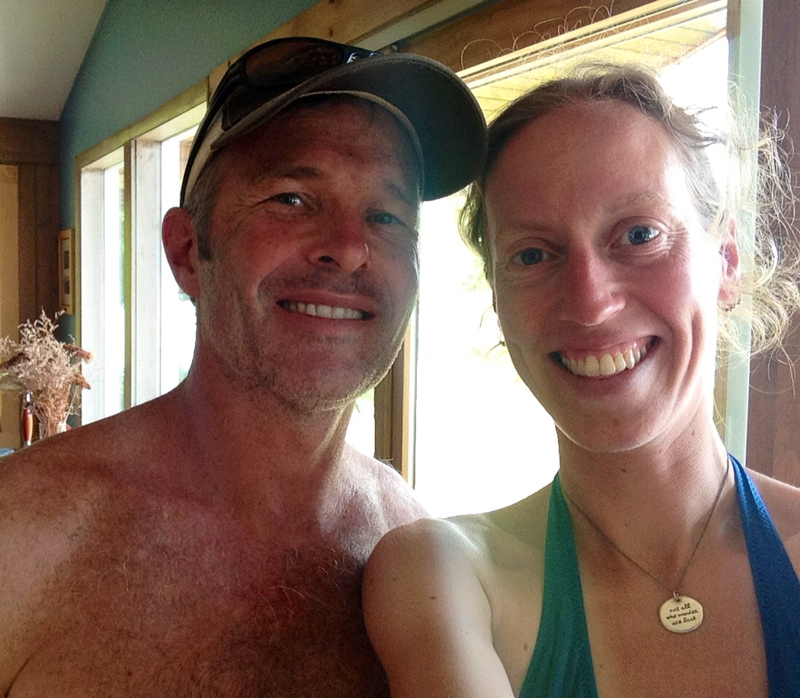 We talked about the lush greenness found everywhere in the state. And we talked about how Vermont has outlawed billboards. I wouldn't have made this observation on my own. But when Liz pointed it out, I indeed couldn't recall seeing a single billboard while riding through Vermont. Wow, what a lovely difference it makes to not be inundated with marketing while traveling through a state. Vermont, oh how I love you! 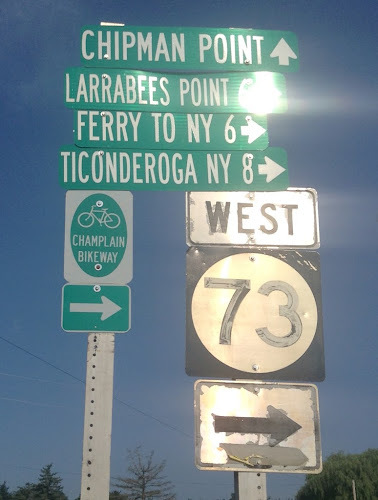 A little tear may very well have developed in the corner of my eye when I saw the sign marking the final six miles of my ride. Only six more miles of riding in Vermont. 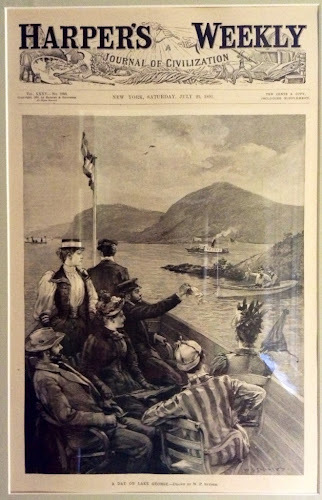 I felt as though I had arrived home when I crossed the ferry across Lake Champlain into Ticonderoga. This was the same ferry I had taken six days ago as I headed out east to Portland, ME. I was done riding by 9:30 this morning. I headed over to the McDonalds to get a cold drink, to revive myself in the air conditioning, and to do some internetting to figure out how to spend the day. I knew, at a minimum, that I wanted to go for a nice swim. I scoped out a public beach on the east side of Lake George. As I was internetting, I received an email from Dave, the cyclist that I met at Bridgewater Corners yesterday. He wanted to let me know that he had posted a photo he had taken of me as well as a little accompanying write up on his photoblog. Reading his note and his blog tickled me pink! One thing I needed to figure out was where I was going to spend the night. 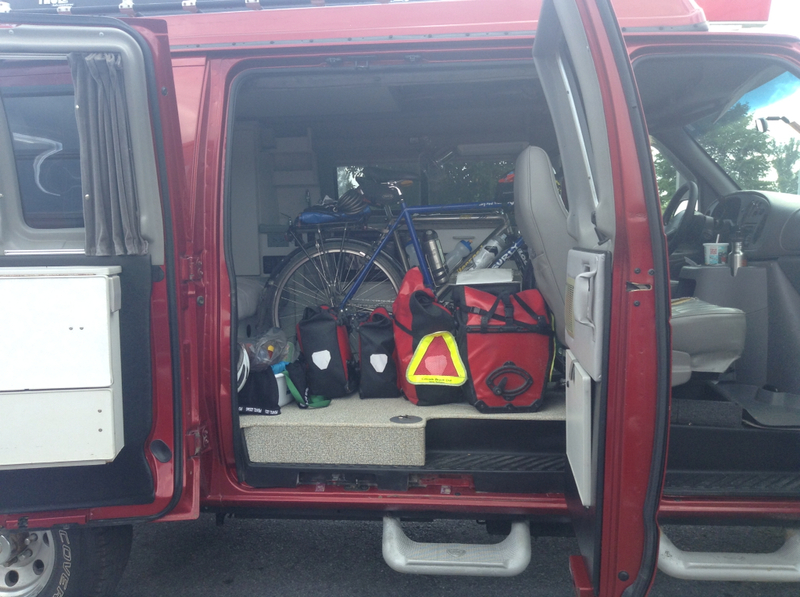 Long-distance cyclists will often stealth camp, stay at churches, and stay at firehouses. I've tried out the first two on this trip, but I hadn't stayed at a firehouse. Perhaps Ticonderoga would allow me that opportunity. I sent an email to the firehouse a few days ago saying that I was on a 3,000 mile ride across the country, that my last day would be in Ticonderoga, and would they be willing to let me stay in their firehouse. I never heard a reply. But then again, I didn't try too hard to follow-up. Maybe that's because something inside of me knew that a better opportunity would present itself. I was completely absorbed in writing yesterday's blog entry when a guy came up to the table where I was sitting and told me that he'd been admiring my bike parked outside. We chatted for a bit about the bike and the ride, and then he asked if I had a place to stay. He said he had a sweet family cottage on Lake George, and that I'd be welcome to pitch my tent in the yard. The guy, John, passed my gut test. So I accepted. Who knew that John would provide the absolute most amazing, sweet cherry to adorn the top of my trip. John's cottage was located 15 miles south of Ticonderoga. We piled everything in the car, and off we went. Shirley and the panniers, ready to ride in John's van. 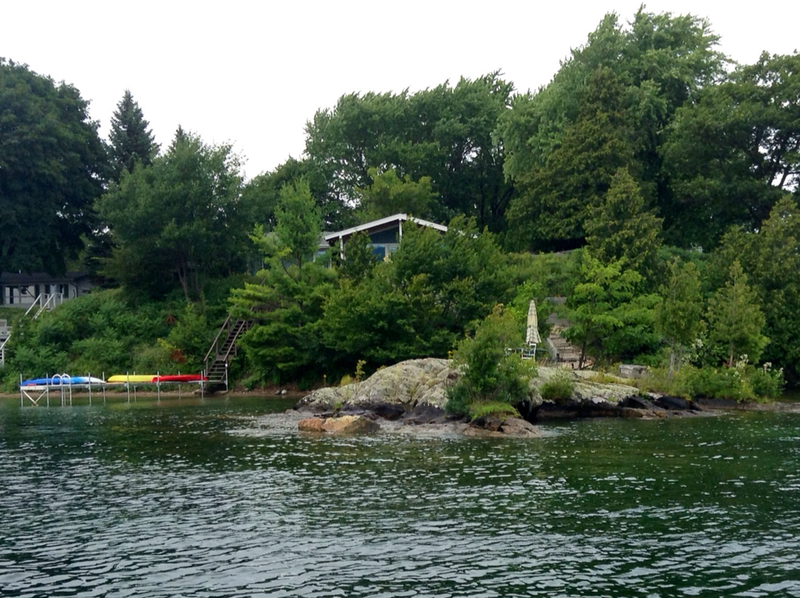 John's cottage is on the west side of Lake George, just above "Turtle Rock." John's cottage, with Turtle Rock in the foreground. Turtle Rock used to be the home of a huge, popular hotel, which burned down many years ago. Turtle Rock, on the cover of an 1891 issue of Harper's Weekly. 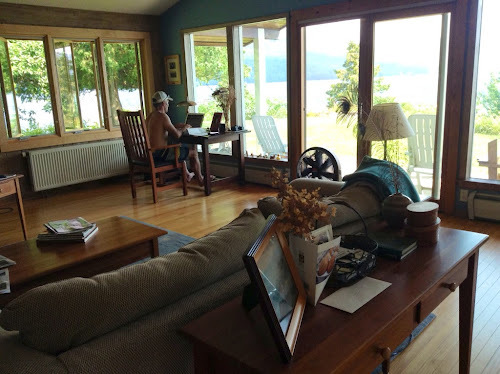 We arrived at the cottage, John showed me around, we went for a quick swim off of Turtle Rock, and then we came back to the cottage for a bit of work. John works from his computer. Nice view, eh? John and his wife recently started an expedition vehicle rental service in Durango, CO called Tonto Trails. What a super cool business! After working for a bit, we went out for a ride on Lake George. The gorgeous view, just off of Turtle Rock. 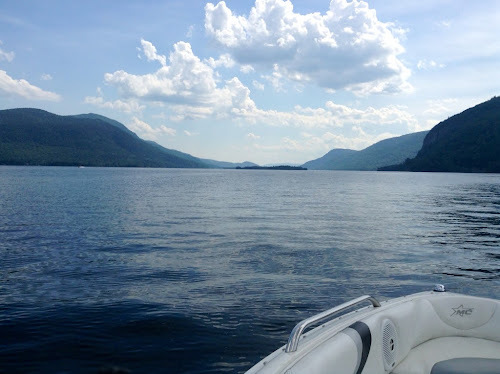 Lake George is absolutely gorgeous! 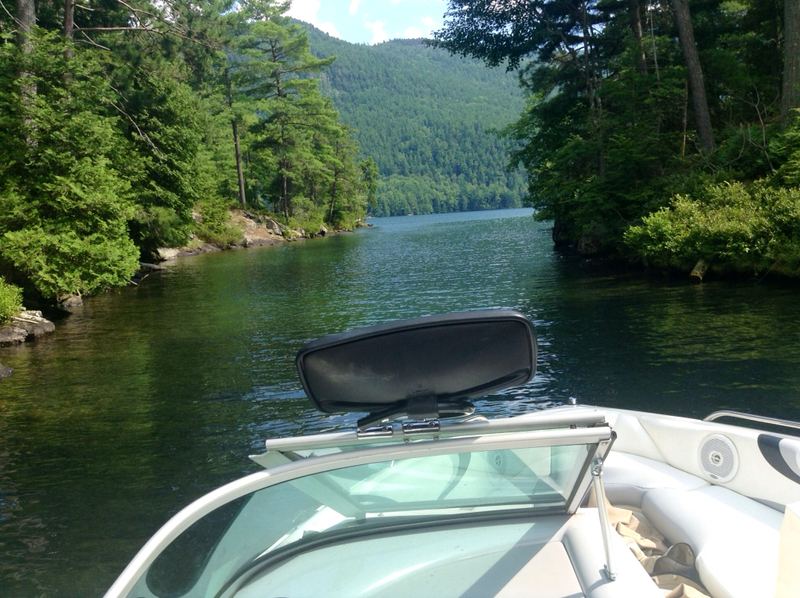 There are tons of little islands on Lake George. The lake and its islands remind me of a miniature version of the San Juan islands. Passing through the Eye of the Needle. John made same tasty beans and grilled vegetables for dinner. 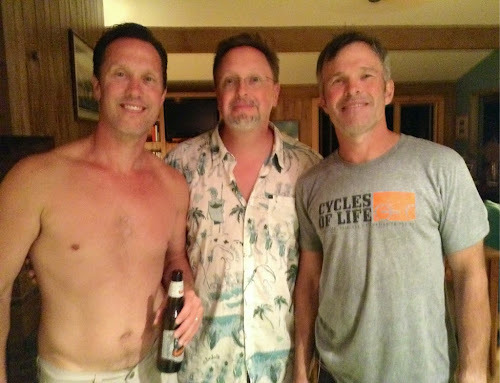 Later in the evening, some of John's friends came over to watch the Tour de France. There was John, five of John's awesome friends (Steve, Joel, Chris, Johnny, and Jim), and me! How lucky of me to be surrounded by such charming and handsome men! After watching the Tour, I was super-duper tired, so I headed to bed. A bit later, Steve came and got me and said I must come out on the boat. You only live once - sleep can wait! 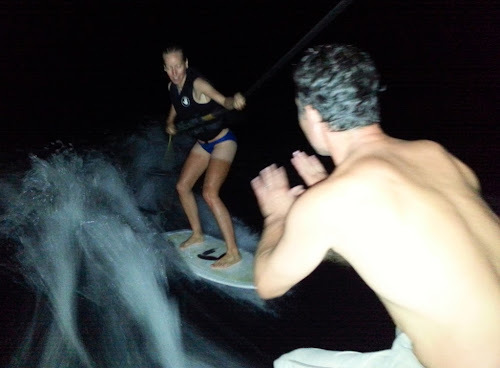 We went out on the boat and everyone took turns wake boarding. I've never wake boarded before, but it looked like great fun. ...and then off I went! Wee! Thanks for the photos, Joel! And thanks to the rest of you for not making too much fun of my ridiculously silly-looking hosiery-like biking tan lines. 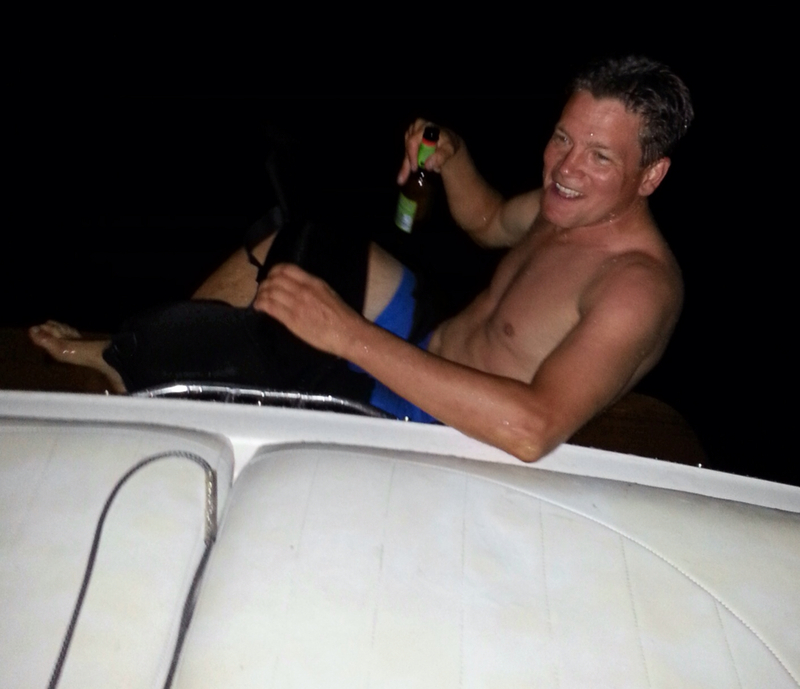 Around 1:30 in the morning we rode over to get Neil, a guy in his young 60s. (John had introduced me to Neil earlier in the day.) Steve pulled the boat up to Neil's boathouse and said, "Neil, let's go wake boarding." A minute or two later, Neil was in the boat. Neil did a couple of runs at the board, and then we dropped him off to go back to bed. What a super cool guy! Chris kept asking me if we were the best hosts on my trip. Indeed, you guys definitely made the last day of my bike trip a memorable one! Chris, asking for the millionth time whether they were great hosts. We got back to the cottage just after 2am. Wowsers! What a rock awesome trip! And what a rock awesome way to celebrate the end of the trip! Many thanks, John, for picking up "the stray" at McDonalds and for showing me an awesome time! Tomorrow I will meet up with my brother (BJ) and his girlfriend (Lilia) to spend the remainder of the month enjoying the Adirondacks. My postings will be less frequent while I spend time with my family, but I look forward to sharing further reflections on my trip in the coming weeks. Although my trip is over, I have an amazing number of memories to carry forward with me. This trip has definitely played a huge influence in my life. There is no better feeling than to have honored my compass. 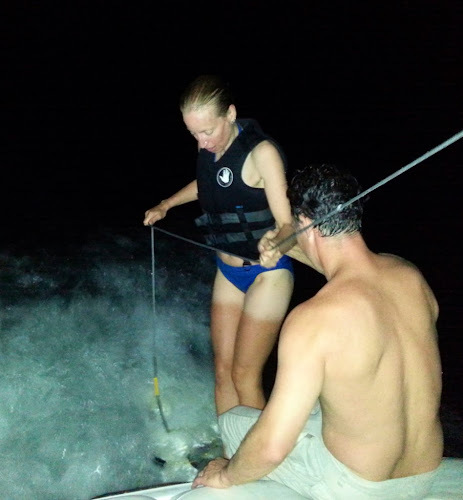 Congrats, Sarah, on completing your trip!! Thanks for sharing your stories--what an awesome adventure! Thanks, Kelly! So glad you followed along! I've made a video of you wakesurfing on YouTube easier to see. Joel.